So here's some things I do to make my life easier in my classroom: My classroom consists of two primary colors- blue and green. 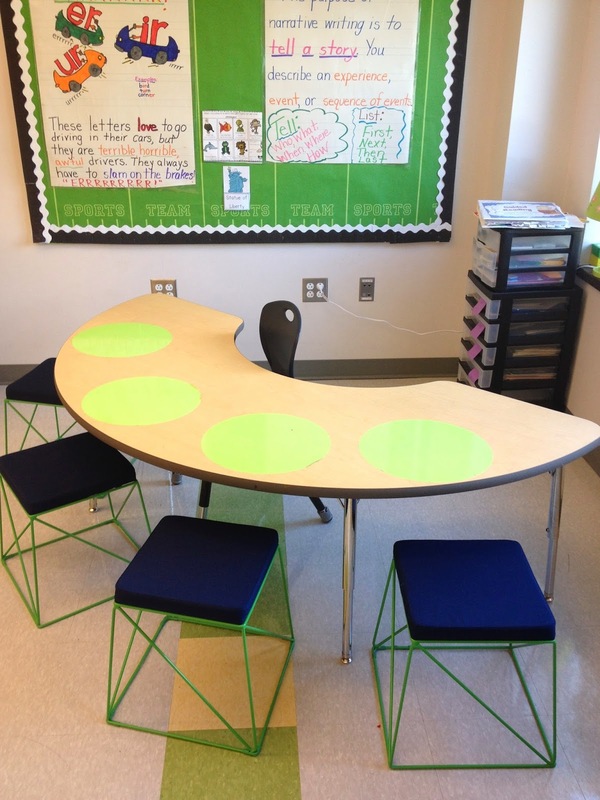 I chose blue and green because they are naturally "calming" colors and we all could use a little "calmness" in the classroom. :-) I have found that sticking to a two color scheme not only makes my classroom look neater, it also makes my life easier. I leave the same bulletin board backing and borders up all year and just change the content of the board with student work as needed. 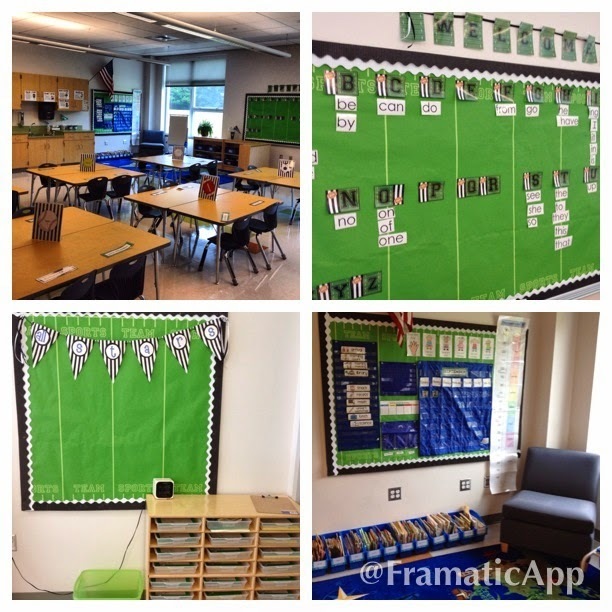 I am so lucky to be teaching in a brand new school! I really like this space above the students cubbies. 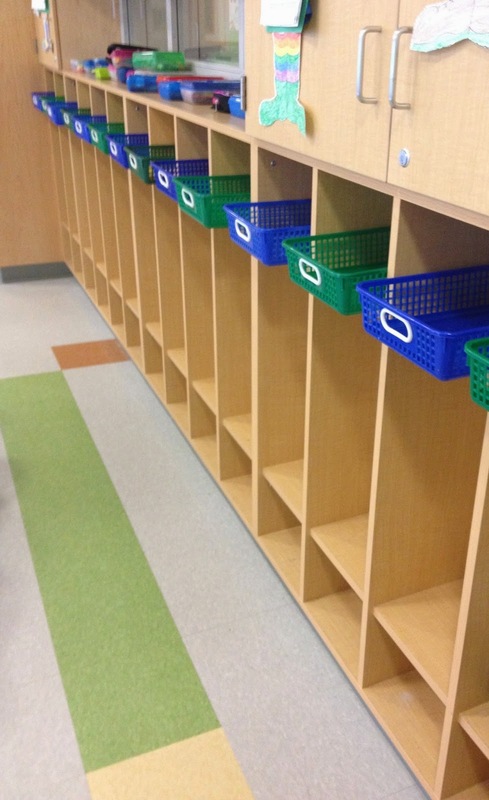 I use these blue and green baskets as "mailboxes" for the students. The kiddos put all the work they have completed for the day, notices, homework, etc. in these mailboxes and then at the end of the day when we pack up, they take all their paper out and add it to their folders to take home. In addition to having mailboxes, students also have cubbies. 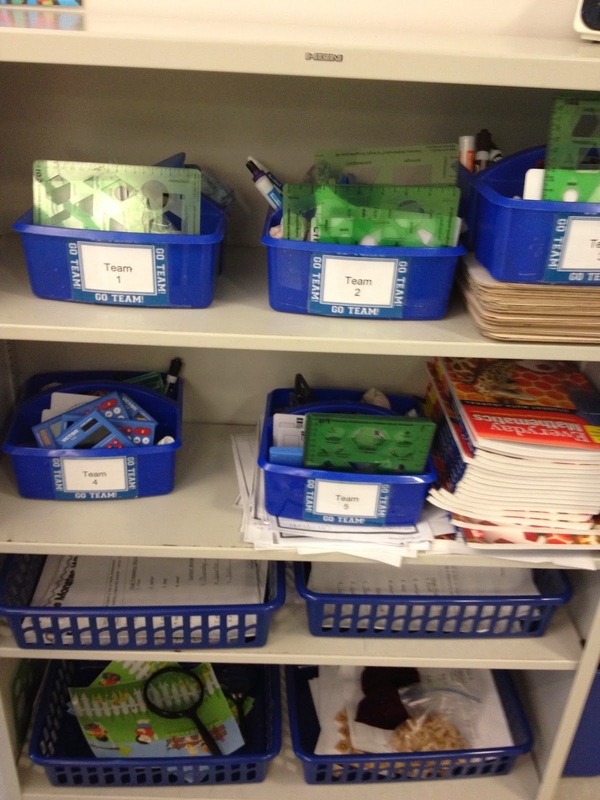 Each student has a plastic drawer with their name on it (clear adhesive labels). Inside their cubbies is their ongoing work. Each student has a red writing folder, blue math folder, purple Daily 5 folder for ongoing word work and writing, a yellow social studies folder and a green science folder. They also store their ear buds for using with our classroom iPads in here. Every week Whenever we have time, we clean these folders out and send work home. We use Everyday Math in our district and my first year I tried the "toolkits" the program suggested. That lasted about a week and then pennies were falling all over the floor, rulers were being used as lazers, and I was about to lose my mind. I then converted to these math bins. 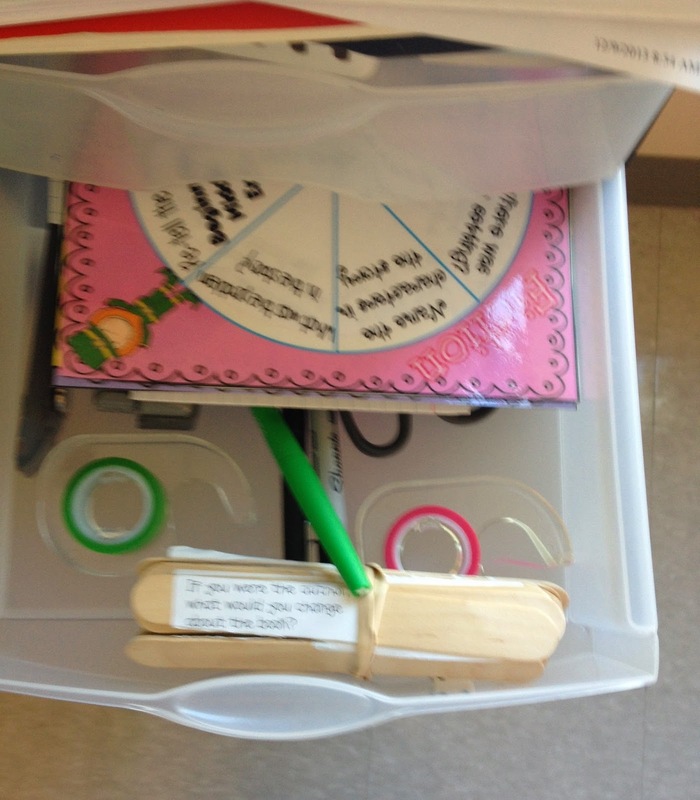 I have 5 tables in my classroom with 4 kids at each table so there is a math bin for each table of students. Inside the math bins are calculators, dry erase markers, socks (dry eraser board erasers), dice, ruler, and shape templates. I found small plastic bins at the Dollar Spot at Target and so there are 10 pennies inside these small containers since the math program utilizes counts of 10 pennies frequently. Each day a new "table captain" is assigned and he/she passes out the math bins, math journals, and dry erase board for their table before we begin our lesson. In the picture above you will see my math bins, dry erase boards for math, and math journals. The last two shelves contain word work for our Daily 5 rotations. I have two classroom libraries. One for leveled readers (pictured above) and one for classroom books organized by theme, nonfiction, and fiction. 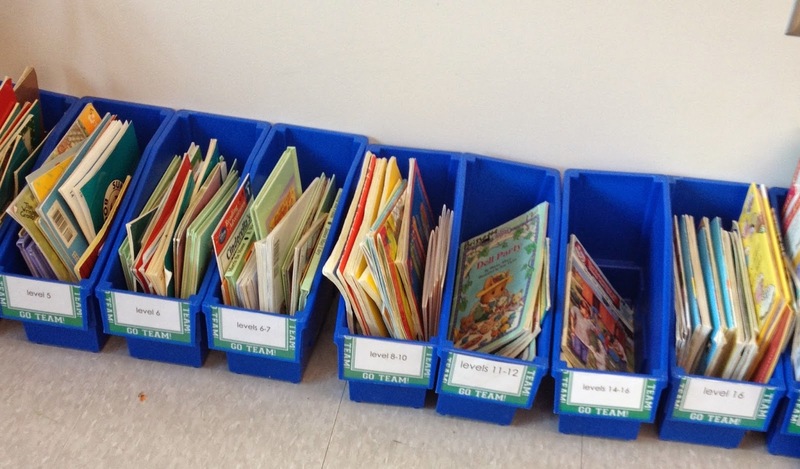 Students have book boxes that look exactly like these leveled reader book bins. They can "shop" for new books for their book boxes weekly or bi-weekly (depending how much time we have). I generally have the kiddos choose 6 books at their "just right" reading level and 2 "dessert books" of their choice from any one of the leveled readers bins and/or our other classroom library. Just behind the guided reading table, and within my reach is this plastic organizing system that I bought at Staples. I have all the materials I need for my reading groups here. 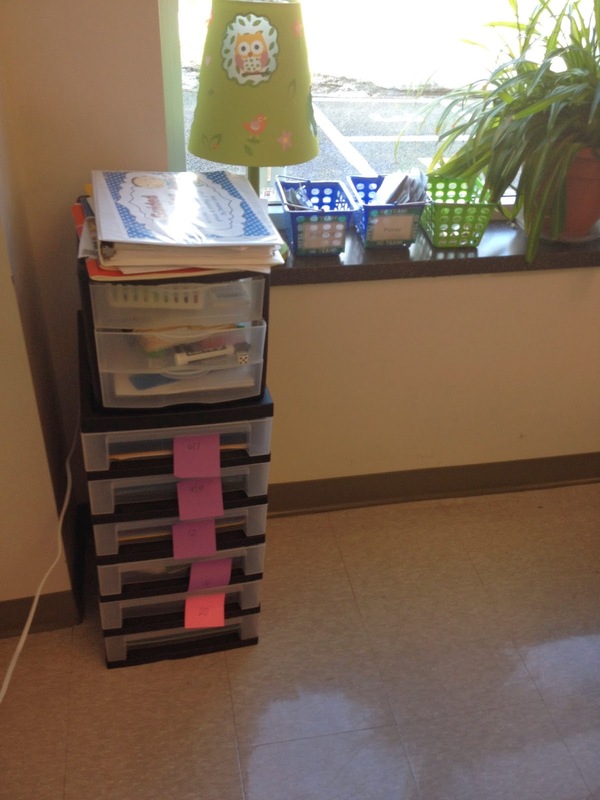 The pink sticky notes are the various numbered guided reading groups I see and in each of those drawers are the books we are working on at each level, folders that the students use for work they are currently working on (reading strategy charts, fluency drills and practice, and reading comprehension practice sheets). 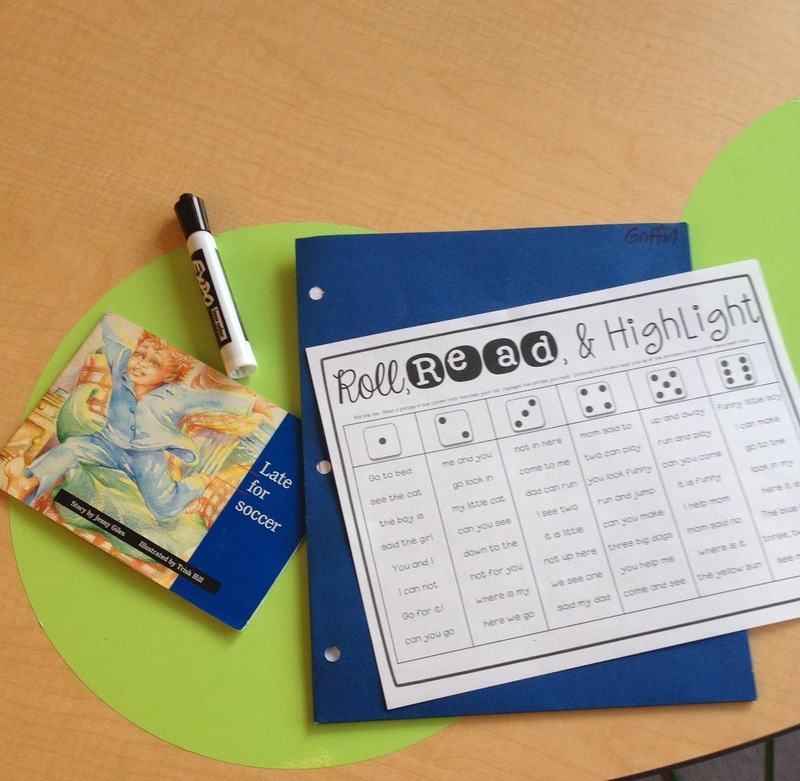 I also keep my teacher resource materials that I need to conduct guided reading groups here too. These materials are in a small 3 drawer plastic file placed on top of my students' files. In here I keep blank running record logs, highlighting tape, story sticks, pointer fingers and more! Perhaps the most handy and the most used organizational tool I have is this plastic six drawer file system that I keep under my desk. 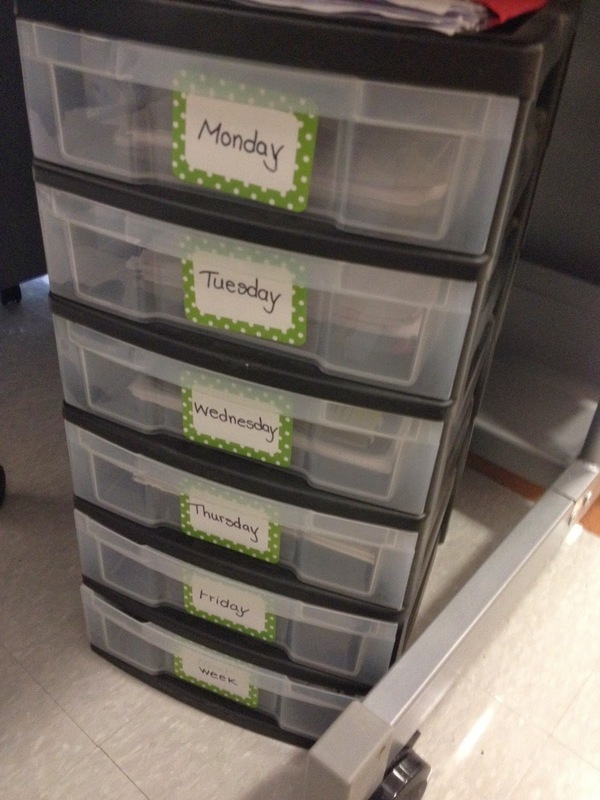 It is labeled with each day of the week and there is one extra bin that I use for extra morning week and extra worksheets. All the work that I have planned for the week goes into the these bins. When I walk in on Tuesday, I open the Tuesday drawer, pull out the morning work that I filed in there after photocopying it the week prior, and add it to the table. 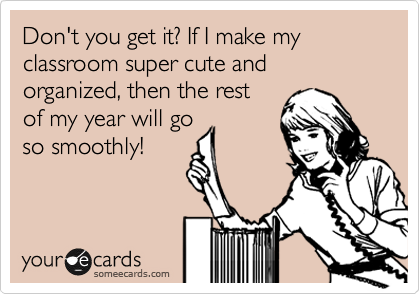 I then disperse homework into the mailboxes and put any other work that is in that drawer that we are going to use for the day, on my desk under my lesson planner to have ready for the day. Easy peezy! 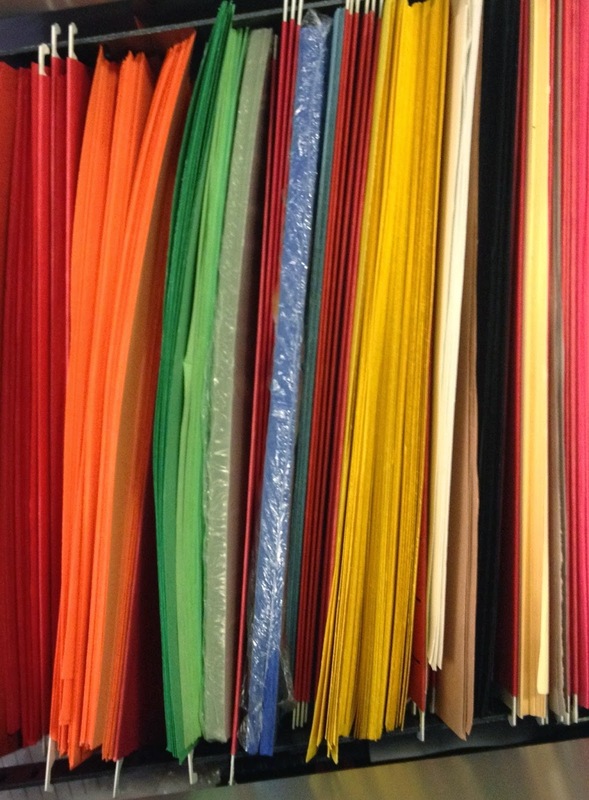 I store my classroom supply of construction paper in files by color for easy access. 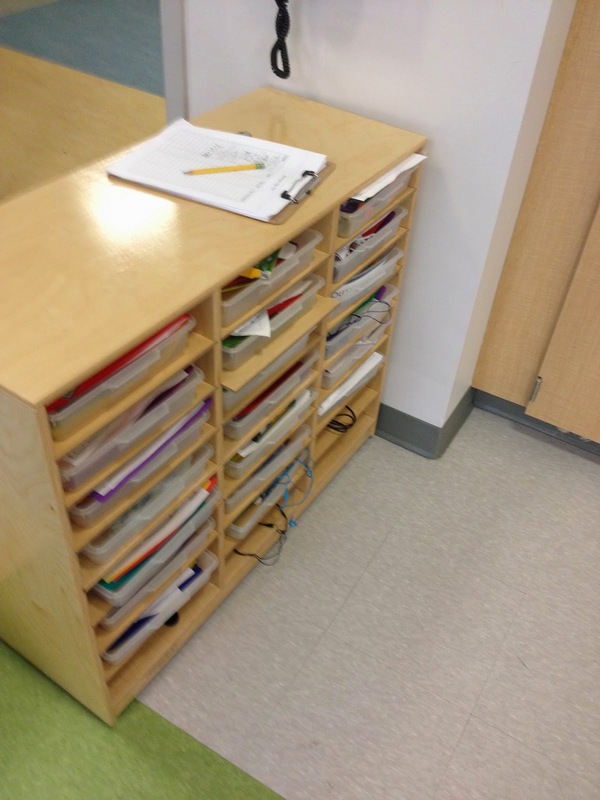 Lastly, each student has a folder filed into a plastic, portable hanging file bin. 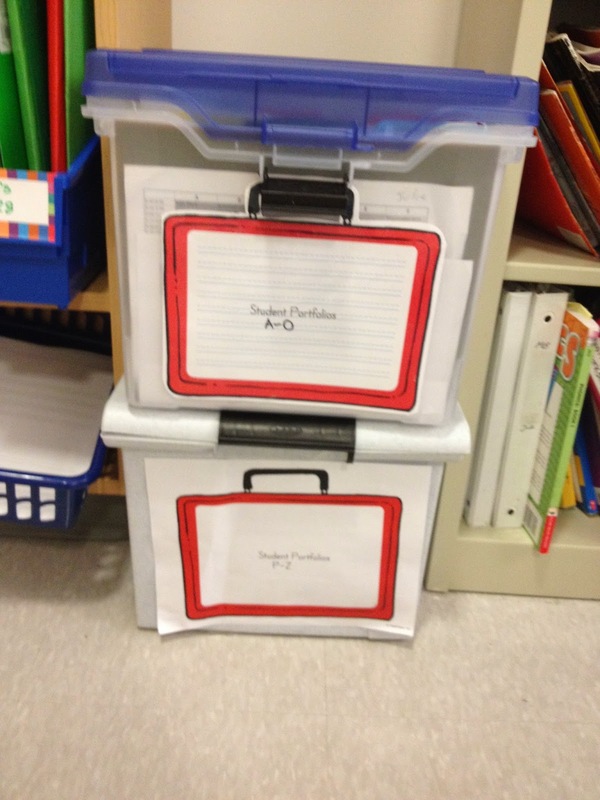 Within these files are a red folder for collecting writing samples, a green folder for collecting spelling and dictation work samples, and a blue folder for collecting math work. This is my data collection and there's a lot of it! Don't you love data? I actually have 2 of these bins (one for last names A-N, and another for O-Z). I like that these are in portable bins so that I can carry them as needed to meetings, parent conferences, and home. I collect these work samples as data for gauging my instruction, reporting out on, conferencing with students and parents, and also for sharing with specialists, SPED staff and others as needed. Whew! O.K. I guess I am a little bit organized. Hopefully, you have some ideas that may work for you and you have some to share with me, I'd love to hear them! I learn so much from other teachers!